To all intents and purposes, merchandising of acts as we know it today began in the 1980s. It was a period of transition, as the ideas that had been powerful in earlier decades (celebrity record players, microphones, etc.) gave way to less childish items like tee shirts, badges and pins, even key rings – slightly more sophisticated gew-gaws to part fans from their money, and an acknowledgement that things were definitely changing. 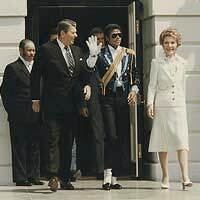 Perhaps the last to see the old school items, and the first to see the new, was Michael Jackson, the biggest pop star of the 1980s. But with the change, all acts benefited. Rock bands, whose fans would have turned their noses up at childish goods, sold their tee shirts and posters, for instance, and during the 1980s merchandise sold on tour began to have a real impact on the income of all bands, rather than just the tops acts. For collectors today, however, the problem lies in identifying authentic merchandise. Those tee shirts for sale might not really be vintage – after all, in the 1980s who imagined they’d ever have a real value? If there’s any plus for those searching, it’s that, in many cases, it wouldn’t be worth the expense of creating fakes, since demand wouldn’t be high enough. Yes, along with the record player (£129), and the dolls (around £50, depending on the era, and if still in the original packaging) and doll clothes, you can find Michael Jackson shirts from the tours, and even soft drink cans – Jackson, or rather the Jacksons, had a deal with Pepsi, so with a little looking you can still find the commemorative cans, sometimes still full, for around £10. It’s an indication of the way collectors view merchandise, but the old school items are worth considerably more than the newer – which explains why someone will pay over £100 for the Michael Jackson record player. The unfortunate truth is that, in most instances, most merchandise isn’t worth a great deal. In the case of the newer items, they were produced in bulk to be sold on tour, and a tee shirt doesn’t hold the same interest as a vintage toy. That doesn’t mean they’ve all been discarded, of course. But the best place to find any of the newer style of merchandise, from buttons to shirts, is on eBay, where you can still buy very cheaply. The downside is that if you’re looking for a good investment, this isn’t it. However, if you’re a collector, and don’t mind an old shirt that’s probably been worn extensively or spent many years in someone’s loft, you could find yourself with a bargain. Even for acts like the Rolling Stones, vintage shirts (at least, vintage according to the claims of the sellers) go for £15-25 – which is less than you’d pay for a similar item at the merchandise booth at any major gig today, and it confers instant history and credibility on the wearer. Buttons and badges can be picked up for little more than a song, although some rarer ones might rise as high as £10. For the most part, though, if you wish to assemble a collection of merchandise relating to a particular artist, you’ll find you can do it on a small budget. Just don’t plan on selling at a profit.